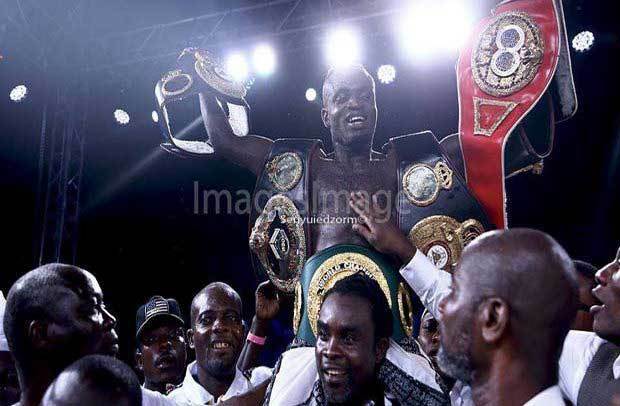 Ghana’s Emmanuel ‘Game Boy’ Tagoe in the early hours of Saturday morning joined the list of World titlists after handing a unanimous points win to South African Mzonke Fana in their vacant International Boxing Organisation (IBO) Lightweight title at the Bukom Boxing Arena ( Trust Emporium). Disaster nearly struck just after the fight had traveled the full distance when the visiting boxer collapsed in his corner after enduring the heavy punches from Tagoe. The medical team, led by Dr Ken Aryettey provided first aid to revive Fana, who was rushed to the Korle-Bu Teaching Hospital where he was treated and discharged. The 29-year-old Ghanaian reduced the 43-year-old former world champion to a mere punching bag from start to finish. Even before the fight developed, he went down two times in round one to the amazement of the large crowd. But he rediscovered his rhythm somehow but he was not a threat at all to the sleek Ghanaian boxer. The well-organized and well attended bouts witnessed by high profile persons from the political and sporting circles including chief promoter Asamoah Gyan was put together by Baby Jet Promotions.